Rachel Palmer (Backward Education Society - BASE): Rachel graduated from the University of Michigan with a BA in Political Science, focusing on international relations and Islamic studies. She then spent two years as a Fulbright English Teaching Assistant on the islands of Borneo and Sulawesi in Indonesia, where she taught and facilitated ESL education workshops for Indonesian teachers. 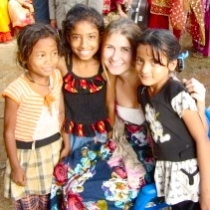 After her fellowship Rachel wrote: "I learned more than I ever anticipated about child labor, working for NGOs, challenges in combating human rights abuses, and legal challenges. This fellowship has been an overwhelmingly positive experience and has shaped my academic focus for next year. I plan to apply to graduate school this fall to study international relations and human rights, focusing on women and children's empowerment."